An adventurous gastronomic trip awaits diners at Passage Thru Malaysia on Main Street in the heart of Greensborough. Enter a rustic Malaysian backyard where the experience is more than just food, with framed photographs of old cities and homeware accents adding an authentic touch to whitewashed brick walls and cartoon murals, ideal for chilling out with a drink in hand. Be transported to Asia with a starter of spiced roti chicken roll with peanut sauce, or delicate and delectable braised pork belly; before a main such as seafood curry laksa with mixed vermicelli and yellow noodles, mussels, prawns, fish cake and a side of Nasi Goreng fried rice. Can't make up your mind? 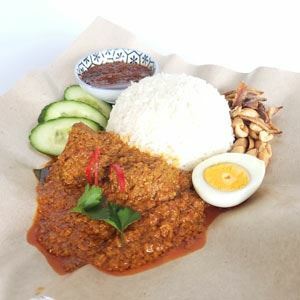 Go triple, with three different curries like the signature Ah Pang chicken, beef rendang, or vegetarian served with rice. Please contact (03) 9435 4958 or hello@passagethrumalaysia.com.au to purchase the perfect gift for your love one! Are you seeing double? Can you spot the difference? Can't spot the difference?? Because there is no difference! Weekday lunch specials and dinner offers, portion sizes are the same! To book your lunch table, call (03) 9435 4958 today.